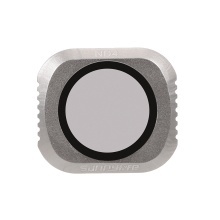 This filter lens is extremely functional, which can absorb the ultraviolet rays from the sun. Also it can help to protect your camera lens from dirty, dust, and fingerprints. It will surely give you a good use experience. DJI Mavic 2 Pro Neutral Density ND4 Filter. Multi-coated, Lightweight, Easy installation. Ultra lightweight, does not affect the gimbal start up calibration. ND Filters: Reduces light hitting the sensor, which slows down the camera&apos;s shutter speed. This creates a more natural-looking motion blur that smoothes out footage and helps reduce the appearance of "jello" effects from the camera&apos;s rolling shutter. They can also be used for reducing lens flare while shooting into the sun and for toning down highlights while filming outdoors.